Paul Caminiti remembers the plane with no wings. He remembers the smell of high-octane gasoline spilled on the ground. He remembers the broken fuselage and the terror he felt, knowing he must climb through a hole in its silver skin and see the horrors inside. He remembers that it was all so strangely quiet, silent but for the rain splattering against the mud and the moans of the victims. Caminiti was among the first people to respond to a military plane crash at Fort Dix in central New Jersey on Friday, July 13, 1956. He was in Army basic training when a Douglas Liftmaster transport plane took off from nearby McGuire Air Force Base at 3:35 p.m., heading for Burtonwood, England. There were 66 people onboard, including servicemen, family members and crew. The plane climbed to about 1,000 feet, then disappeared from the airport’s radar screen. 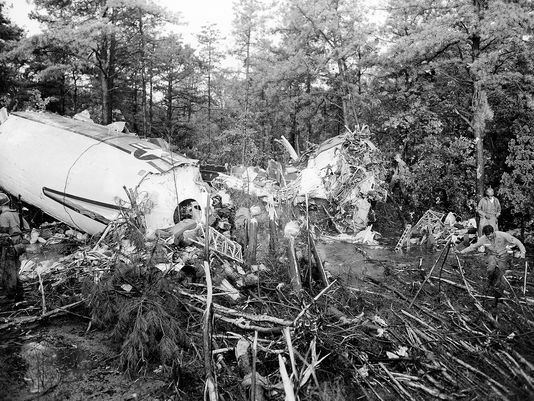 As it plummeted, the aircraft rammed the forest treetops, which sheared off its wings, engines and tail. 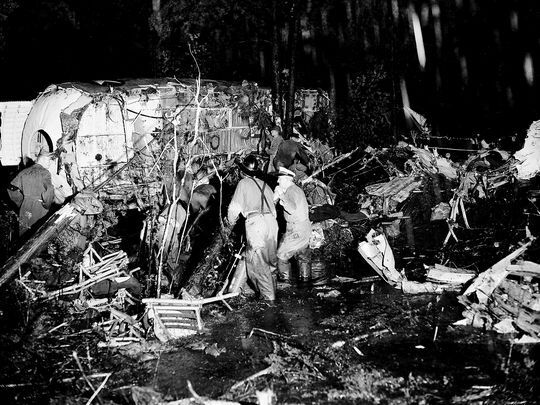 Caminiti and his platoon bushwhacked to the scene and saved 21 people, one of whom died later from injuries sustained in the crash. And they risked their lives, clambering over ground soaked with combustible airplane fuel, to retrieve 45 bodies, including five women and two children. The next day, news of the crash dominated front pages and radio broadcasts nationwide. Newspapers printed the names of the dead ― among them 2nd Lt. William A. McCants of Macomb, Ill.; Airman 2nd Class Manuel Casey Jr. of Shreveport, La. ; and 1st Lt. Lillian L. Mueller of Paterson, who was a flight nurse and a member of the plane’s crew. Then, like the rest of America, Caminiti forgot about the crash. He left the Army after two years, raised a family and enjoyed two successful careers. Recently, Caminiti remembered. This Memorial Day, he asks us to remember, too. The people onboard that plane did not die in war. But they died in service to our country. They should be honored, he said. They deserve nothing less. It was a bad day to fly. On that afternoon in mid-July, 1956, a “baby tornado” hit Camden, 40 miles away, demolishing a diner, according to The New York Times. At around 3 p.m., “blinding rain,” lightning and hail lashed central Jersey, The Associated Press reported. The rain continued as a silver Douglas C-118a Liftmaster operated by the Military Air Transport Service taxied down the runway at McGuire Air Force Base. Diminutive by modern standards, the airplane seemed huge at the time, powered by four Pratt & Whitney “Double Wasp” piston engines capable of cruising at 315 miles an hour. The plane cleared the runway, rose to the edge of the clouds, then dropped out of the sky. A panel of Air Force experts later determined it was downed by wind shear. The plane crashed three miles from the runway, clearing a path 600 feet long and 80 feet wide through the forest at Fort Dix, which at the time was a separate Army base immediately adjacent to McGuire. Air-traffic controllers at McGuire, accustomed to losing radar contact with airplanes during rainstorms, didn’t notice anything amiss. So the surviving passengers had to save themselves. Dazed and bleeding from his right hip, Kiley stumbled into Cpl. Rudolph Johnson, who was delivering mail when he heard a loud noise that “seemed to come from the middle of the woods,” he told The Times. Johnson placed Kiley in an Army vehicle and drove to a superior’s office. At 4:20 p.m., base commanders learned that a planeload of servicemen had gone missing for nearly an hour in the middle of the most densely populated state in the country. It was a bad day for tromping through the woods, too. When the accident happened, Caminiti figures his platoon was about half a mile away, learning the rudiments of Army maneuvers. The rain was falling so hard, and the woods were so dense, they heard nothing. Their commander informed them of the crash and ordered them to march. Using folding shovels, the men hacked through the brush, sinking to their hips in mud. “It was like walking through deep snow,” Caminiti said. Thirty minutes later they entered the clearing. They reached the plane, and stopped. They scrambled up a hill of mud and debris. Inside, the scene was horrific. The living moaned. The dead lay in piles. A woman held her baby to her chest. Both were dead. Rescuers opened the plane’s galley door. A man jumped out and ran screaming into the woods. Commanders ordered the men to retrieve people from the plane and lay them on the ground. Trainees removed their own clothes and draped them over the bodies to mark the dead. Soon every man in the platoon was working in the driving rain, wearing just his Army-issued underwear and boots. More military units arrived. Engineers used bulldozers to clear a road to the site. Doctors and nurses performed triage. At sunset, they erected banks of lights powered by diesel generators. After about five hours, Caminiti and his platoon rode back to their barracks. The platoon’s captain, a Korean War veteran, skipped his usual dinner at the officer’s club and joined his men in the mess hall for mashed potatoes and meatloaf. “He said, ‘You’ll never see anything like this unless you’re in combat. And I hope you never, ever have to see combat,’ ” Caminiti said. Caminiti never saw war. 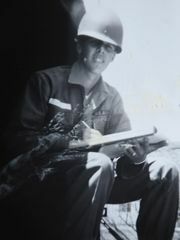 After basic training, he went to Hawaii, where he worked on radio communications. After he was discharged, he became a computer programmer, retired, and founded a custom furniture company. Caminiti has nine grandchildren. Only when they started asking about his military service did he think of the crash. His memories were hazy. He went to the New York Public Library and searched for newspaper stories on the accident. As Memorial Day approached, Caminiti invited a visitor to see his private memorial to that day. Upstairs, in his home office, he opened a closet door. There on a shoe rack sat a pair of Army-issued brown boots, the same ones he wore as he worked in the driving rain to carry out the survivors and the dead.